Industrial applications such as laser and plasma sources, particle accelerators, industrial heating and welding machines can stress RF power transistors with a lot of reflected energy due to very high impedance mismatches. In laser generators for instance, lighting the plasma will require a transient period that will drive the transistor into avalanche for a short period of time. LDMOS RF power transistors have become extremely well suited for such demanding applications and are increasingly replacing vacuum tubes such as triodes and magnetrons. 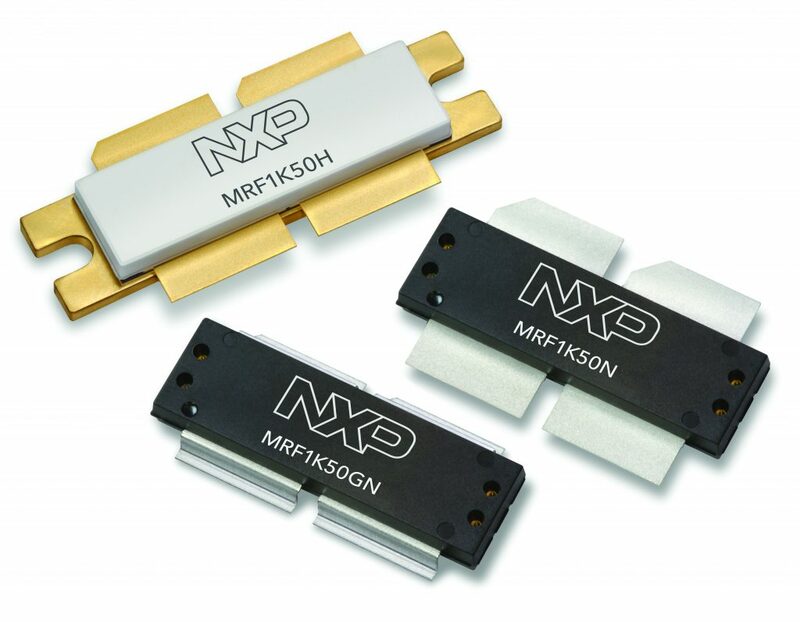 The new MRF1K50H LDMOS RF power transistor from NXP sets new standards for these applications, as it combines extreme ruggedness while delivering the highest RF power level of any transistor in any technology operating at any frequency. The MRF1K50H produces 1.5 kW operating at 50 V up to 500 MHz, which makes it possible to reduce the number of transistors and other components required to produce a given RF output, easing the design complexity and lowers combining losses, power consumption, and cooling requirements. Like all of NXP’s series of extremely rugged LDMOS transistors, the MRF1K50H can survive a VSWR of 65:1 and has the added advantage of being able to absorb 50% more energy than its predecessor, the 1.25-kW MRFE6VP61K25H, which increases its reliability and makes it an excellent alternative to vacuum tubes. The MRF1K50H is housed in a ceramic air-cavity package and is impedance compatible with existing RF power transistors on the market: it can simply be dropped into existing systems without the need to redesign the printed circuit board (PCB), requiring only a light retuning. Even greater reliability can be achieved with the MRF1K50N, an over-molded plastic version of the transistor that lowers the junction-to-case thermal resistance by 30% compared to the MRF1K50H. In addition to extracting more performance from RF power transistors, NXP’s high power over-molded plastic packages simplify amplifier manufacturability thanks to tighter dimensional tolerances and better solder connections. 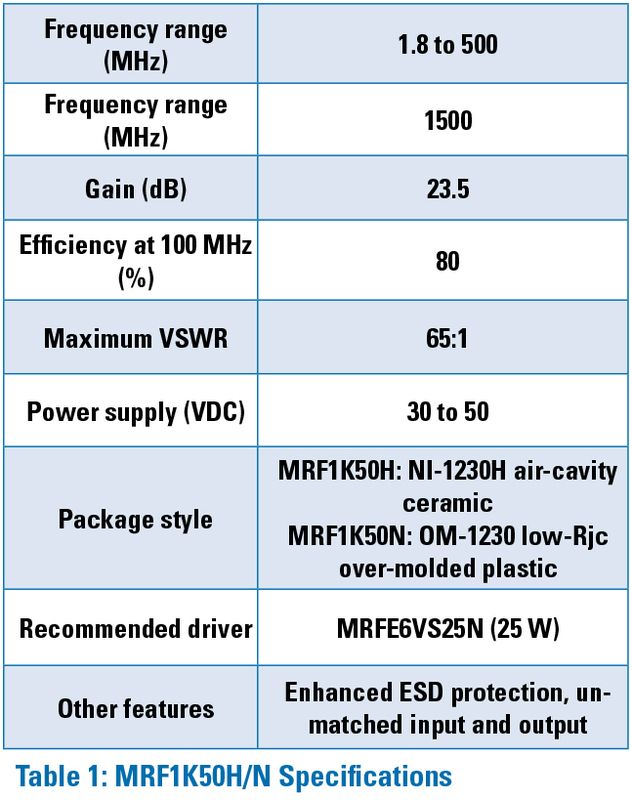 Specifications for both versions include efficiency of 80% at 100 MHz, gain of 23.5 dB, and minimum breakdown voltage of 135 V. Detailed specifications are shown in Table 1. These devices are part of NXP’s Product Longevity Program, ensuring their availability for at least 15 years. Both transistors are currently sampling and reference circuits for various frequencies are available. More information is available at www.nxp.com/rf.